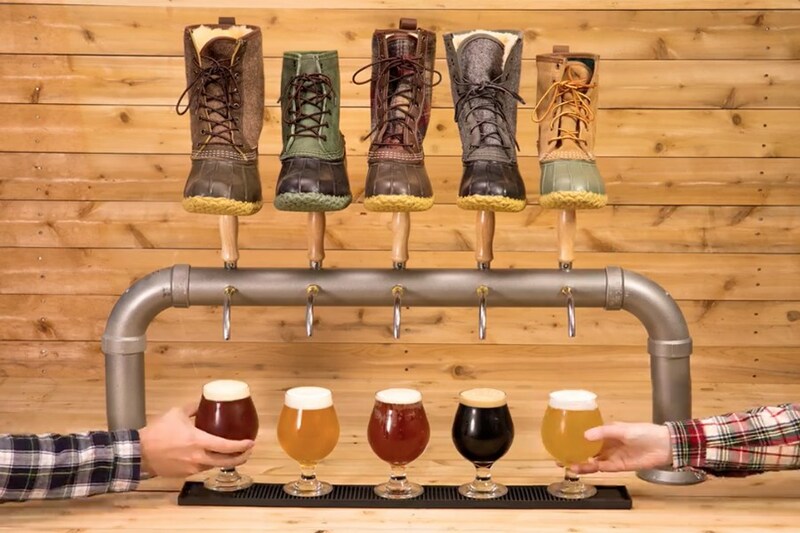 To coincide with this season’s forthcoming line of “small batch” Bean Boots, iconic Maine retailer L.L.Bean has teamed up with a handful of local breweries this fall. Portland-area breweries Rising Tide and Mast Landing; Orono Brewing Company; and Fogtown and Threshers brewing companies, both located along Route 1 near Acadia National Park, are releasing new “outdoor-inspired” brews at an invitation-only event in Portland next week, before rolling them out in their taprooms and in the Maine market. “The same culture and sense of place that launched L.L.Bean more than a century ago now fosters growth in the craft beer industry,” the company says, citing a Maine Brewers Guild statistic that craft beer contributed $228 million into the local economy in 2017. The breweries are keeping details about their outdoorsy recipes under wraps until the big reveal on Thursday, Oct. 18. The brews will be available on draft at each place’s taproom in the days after that, with Orono Brewing, Rising Tide, and Mast Landing planning to can theirs as well. Boston has reached out to each brewery to see if it plans to distribute its L.L. Bean collaboration around Boston, but it doesn’t seem likely. Rising Tide, which has a presence here, will keep distribution limited to only some Maine locations, says owner and business operations director Heather Sanborn. “It’s a great time of year for a quick weekend trip from Boston up to Portland!” she adds via email. Peak foliage season is beautiful around Acadia, too. But rest assured, of course, that the uniquely colored and detailed fall and winter “small batch” Bean Boots will make it to Boston-area shops. Introducing #BeanBootsandBrews, a collaboration between L.L.Bean and Maine craft breweries! Five amazing brewers – @fogtownbrewing, @mastlanding, @oronobrewingcompany, @risingtidebeer and @threshersbrewingco – will be unveiling outdoor-inspired small batch beers, to complement our new fall collection of Small Batch Bean Boots. Starting 10/19, these beers will be available at the breweries and through limited distribution. Stay tuned for details, and a look behind the curtain at how beer and boots are made. Cheers to Maine craftsmanship! (Video by @pjhavel and @Jackiegreaney) * * *Please drink responsibly and with moderation. This content is for responsible adults of legal drinking age in the United States of America (21 years old or older). It is purely intended for entertainment purposes.